Fact Check: Candidates Don't Tell The Whole Stories In First Debate : It's All Politics In the prime-time Republican presidential debate Thursday, the candidates bragged about their records as governors and in the private sector, but the facts didn't always add up. Former Florida Gov. 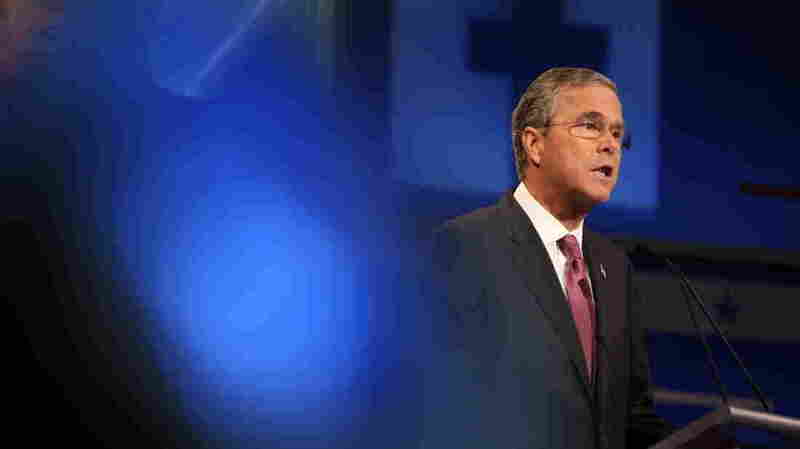 Jeb Bush speaks during the first Republican presidential debate Thursday in Cleveland. Bush touted his jobs record in Florida. Republican presidential hopefuls tossed around a lot of statistics during their debate last night. Some of those numbers are revealing. Others may be concealing or at least don't tell the whole story. Here's a closer look now at some of the claims made by the candidates. Claim 1 — Jeb Bush: "Our economy grew at double the rate of the nation. We created 1.3 million jobs. We led the nation seven out of those eight years." Bush was talking about the Florida economy when he was governor. He says he can replicate that growth rate nationwide, by reforming the tax code and cutting regulation. A lot of economic observers are skeptical, though. They note that Florida's boomlet during Bush's tenure was largely the result of a housing bubble that burst in spectacular fashion after he left office. Bush has been saying he wants to boost national economic growth to 4 percent a year. That's a lot faster than either his brother or father managed when they were in the White House. Bush was not alone in bragging about his gubernatorial record. Many of the others did the same, in particular about the economy. Claim 2 — Scott Walker: "Before I came in, the unemployment rate was over 8 percent. It's now down to 4.6 percent. We've more than made up for the jobs that were lost during the recession." Walker, the governor of Wisconsin, is billing himself as a turnaround specialist. He's campaigning as someone who brought conservative discipline to what has been a traditionally Democratic state and put a lot of unemployed people back to work. What Walker didn't say, though his Fox questioner did, is that Wisconsin has added only about half as many jobs as he promised when he first ran for governor. Both jobs and income have grown more slowly in Wisconsin than in neighboring Midwestern states. Actually the governor with the best claim to economic leadership didn't make it into the prime-time debate last night. That's Texas Gov. Rick Perry. Texas did enjoy robust growth, even during the depths of the economic downturn. In fact, according to an NPR analysis of economic data, Perry can claim the best jobs record of any governor running for president. Employment grew in Texas at four times the national rate while Perry was governor. Employment also grew relatively quickly under Bush. Under Walker, in fact, job growth was substantially slower than it was in the nation as a whole. Of course, the so-called "Texas Miracle" has its critics, and not everyone thinks Perry deserves all the credit. Indeed, it's hard to determine exactly how much credit any governor deserves for job growth in his or her state. Claim 3 — Donald Trump: "The fact is, I built a net worth of more than $10 billion, I have a great, great company, I employ thousands of people, and I'm very proud of the job I did. Again, hundreds of hundreds of deals. Four times, I've taken advantage of the laws, and frankly so has everybody else in my position." Trump is also touting his economic record, not as a politician but as a businessman. But he was asked last night about some of his business setbacks, and the four times that Trump-related companies filed for bankruptcy. Trump made no bones about that last night, saying he took advantage of the bankruptcy laws to walk away from his debts in a handful of business deals, leaving his lenders — whom he described as "total killers" — with more than $1 billion in losses. It's also noteworthy that Trump's claim of being worth $10 billion includes a lot of intangibles that he assigns as the value of the Trump brand. Bloomberg took a sharp pencil to his holdings and came up with a considerably lower figure — less than $3 billion. An earlier Forbes assessment estimated his net worth at about $4 billion. Trump has dismissed, in particular, the Bloomberg estimate, saying it doesn't know what he has. Nevertheless, Trump suggested that he's got the know-how to deal with the federal government's trillions of dollars in debt. Presumably that would not involve filing for bankruptcy. Claim 4 — Mike Huckabee: "We've decimated our military. We're flying B-52s. The most recent one that was put in service was November of 1962. A lot of the B-52s we're flying, we've only got 44 in service combat ready. And the fact is most of them are older than me." Former Arkansas Gov. Huckabee warned of what he said were dangerous cutbacks in U.S. military strength. Neurosurgeon Ben Carson also took up this theme, saying the U.S. Navy is the smallest its been since 1917. One might remember Mitt Romney made similar claims in 2012, only to have President Obama poke fun at such anachronistic measurements, saying the military is using a lot fewer horses and bayonets than it used to. But even if B-52s aren't the right yardstick, the military budget is shrinking — at least in relative terms. For decades, the U.S. spent more on defense than the next 10 countries combined. Last year, that fell to the next nine countries — and by 2020, the U.S. could be spending only as much as the next five biggest countries combined. Spending caps that grew out of the 2011 bipartisan budget negotiation would limit next year's military budget to $499 billion. Republicans and Democrats both say that's not enough. But Obama insists that any increase in the defense budget should be accompanied by a similar increase in domestic spending. And that's where the fight is brewing. George W. Bush in fact announced Christie's nomination to the position on December 7, 2001, according to the White House, and he wasn't sworn in until January 2002. According to a Christie campaign spokesperson, Sept. 10, 2001, was when he got the call to be U.S. attorney. It's a difference of only a few months, but it was a big part of Christie's attempt to construct a narrative of how he has fought terrorism. Claim 6 — Donald Trump: "In July of 2004, I came out strongly against the war with Iraq, because it was going to destabilize the Middle East. And I'm the only one on this stage that knew that and had the vision to say it." FLASHBACK via @Reuters from 2004: “Donald Trump Would 'Fire' Bush Over Iraq Invasion” It's called great vision. However, by July 2004, a lot had already happened in the Iraq conflict: Saddam Hussein's regime had collapsed, Bush had declared the end of major combat operations, and the U.S. had transferred power to Iraqis. All of which is to say that Trump's framing here is a little misleading. He seems to say he foresaw trouble in Iraq before the war. In fact, the U.S. had gone into Iraq more than a year before.